What happens to urban space given a hypothetical future where all information loses its body, that is, when it is offloaded from the material substrate of the physical city1 to the personal, portable, or ambient displays of tomorrow’s urban information systems? 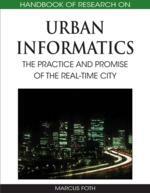 This chapter explores the spatial, technological and social implications of an extreme urban informatics regime. It investigates the total virtualization of the marks, signage, signaling and display systems by which we locate, orient ourselves, and navigate through the city. Taking as a vehicle a series of digitally manipulated photographs of specific locations in New York, this study analyzes the environmental impact of a pervasive evacuation of information–at various sites and scales–from the sidewalks, buildings, streets, intersections, infrastructures and public spaces of a fictional future De-saturated City. At a smaller scale, signage displaying precise wait-times for busses, trams or subway trains equipped with GPS or other location-based technologies is becoming common in large cities such as Berlin, Rome, and New York. In 2000, New York City-based Adapt Media of Boston introduced AdRunner: a GPS enabled LED display designed for the roofs of taxi cabs that delivered location-based advertising customized for the neighborhood demographics they move through.3 In Toronto, 13,000 cabs have been outfitted with touch screen displays that use GPS to target customers as they drive by local businesses (GPS World, 2007) . Whether it be building-scale display surfaces or smaller mobile screens distributed throughout the city, the trend appears to be toward finding new and inventive ways for displaying real-time or demographically targeted information in physical urban space. Visions of the future promulgated by popular media project this trend to the extreme. Take for example a scene from Steven Spielberg’s 2002 movie Minority Report, which projects the future of location-based advertising in the city of year 2050. In a chase scene depicting renegade cop Jon Anderton’s flight through a shopping mall, he is bombarded by advertising tailored to his specific location, time and identity as revealed through a retinal scan. Illuminated advertisements that recall his personal preferences and history of shopping transactions call out for his attention as he darts through a cacophony of sound and image. In developing this scene, Spielberg worked with a combination of advertising “creatives” and researchers from MIT’s media lab to extrapolate forward a vision of how advertising might work in the future (Rothkerch, 2002). What’s perhaps interesting here is less the imagined technical wizardry at work in, say, performing retinal scans on the fly and correlating the unique patterning of neural cells and capillary structure with a personal transaction history—all in real-time, and for a rapidly moving target. Rather, as with most science fiction, what’s striking is how this future scenario carries forward existing paradigms of advertising embedded within the present, and what that might tell us about the place of media and information within contemporary culture. Personal Informatics: Information services, often accessible via a mobile device, that search, sort, mine, correlate or otherwise filter information for a person based on their preferences, transaction logs, location, social networks and other personal data. Urban Screen: Large, programmable, outdoor electronic billboards displaying media for commercial and advertising purposes, often affixed to buildings or other prominent urban structures. Locative Media: Art and technology practices that employ location-aware technologies in exploring novel or unconventional relations between cartography, place, community, sociality, and technology. Public Authoring: The open, public process of associating virtual media objects and other types of information to actual locations in the city, whereby people are enabled to construct and contribute to this information layer, rather simply consuming pre-authored content. Location-Based Services (LBS): A combination of hardware and software technologies that incorporate mobile devices, wireless communication networks, geographic information, and software applications in serving information related to specific locations or routes. Geocoding: The process of associating geographic metadata (such as latitude/longitude coordinates) to physical features within natural or constructed environments. Skeuomorph: Material artifacts that simulate an aspect of a previous time using a technology that has superseded it. Skeuomorphs are derivative objects that retain structurally necessary elements of the original as ornamentation, stripped of their original function.